Late-afternoon Sundays are a ritual for the Madalosso Family. As soon as the polenta pans, the chicken trays, and the 4,645 seats of the biggest restaurant in the Americas are empty, a wooden table in the back of the establishment’s parking lot, in the neighborhood of Santa Felicidade, Curitiba, becomes a meeting point for four generations of people linked to gastronomy. Flora Madalosso Bertolli, responsible for the first chapters in history which changed the course of this family of Italian immigrants, slowly walks through the cobblestone sidewalk from her home to the most famous restaurant in the capital of Paraná. This 79-year-old lady passes right by the entrance room, where her siblings, children, nephews, and grandchildren take turns sitting at the table to have their afternoon coffee, and returns minutes later. This is one of her rituals: as soon as she steps home, she changes her clothes, spattered by risotto and cooking oil, for a comfortable set of nightgown and cardigan sweater, and only then she sits down to eat. “We gather here every Sunday. It is the only time of the day when everybody can,” explains Flora. The more than 20 members of the family (spanning four generations) are used to the constant work during the weekend. 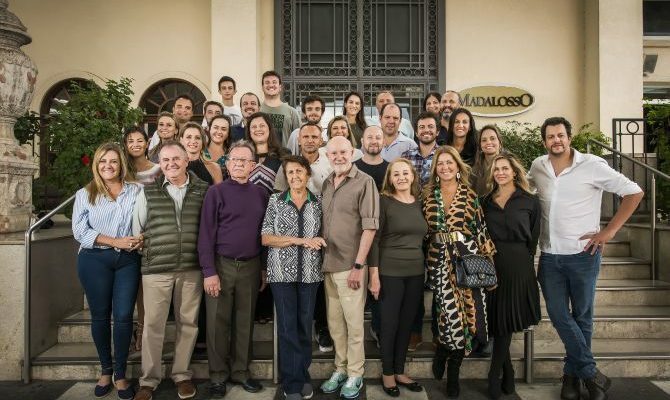 For 55 years they’ve kept a routine entirely dedicated to maintaining 15 gastronomic establishments within and without the borders of the Santa Felicidade neighborhood (Restaurante Madalosso, Famiglia Fadanelli, Mezza Note, Dom Antonio, PaniCiello, Spring, Anello, Velho Madalosso, Forneria Copacabana, Dona Helena, Comedy Club, and Fundição 52). All of their trattorias, pay-by-weight buffets, bakery, and night bars originated in the two restaurants which began the family’s trajectory: Velho and Novo Madalosso. Nowadays, everyone who crosses the portal welcoming those who enter the Italian neighborhood and cruises down Manoel Ribas Avenue until the number 5,875 can barely imagine that the imposing 7,671-square-meter building of the Novo and the picturesque façade of the Velho, on the other side of the street, are the product of a desperate attempt to defeat poverty. Antonio Domingos Madalosso (called Don Antonio by the family) and Rosa Fadanelli were sons of Italian immigrants from the Veneto region. In 1949, the couple left Caxias do Sul, Rio Grande do Sul, to try their luck on grape plantations in Paraná. “We came here without a single penny. At the time, we were thinking about how to make money, because people were extremely poor – were in need to health, hygiene, education,” says Carlos Madalosso, father of chef Beto Madalosso and one of the six children the couple had. Nowadays, he owns Novo Madalosso, Família Fadanelli, and Mezza Notte. Don Antonio insisted for a few years in the grape vines, but nature didn’t seem willing to pay back their investments. Due to the high acidity of the soil and the irregular frosts, not even White Niagara nor Rosada grapes, the varieties cultivated by the family, prospered in their Santa Felicidade lands. They were forced to try to obtain money in other ways. It wasn’t easy. 66-year-old João Antônio Madalosso tells that, despite his father being an entrepreneur, he wasn’t successful in any of his businesses. “As well as the grape vineyard, owned a chicken grange, an auto body shop, a carpentry shop, he bottled drinks… whenever someone told him something would yield him a profit, he would try it,” remembers the youngest of his sons, owner of Dom Antonio restaurant. In the end, his nonno‘s schemes earned them what would later be essential for the formation of the Madalosso empire: good pieces of land throughout the neighborhood. “They were very cheap then. This land here, for instance, we rented it from a family of Italians, and as soon as we got a little money, we were able to buy it,” explains Carlos in front of the stairway of the Novo Madalosso. He points towards the back of the parking lot, in the direction of a green horizon filled with araucaria trees, and the Atlantic Forest which extends beyond eyesight. The area encompassing the Novo Madalosso restaurant and the six houses which belong to the family is 76 thousand square meters big – more than the 70 thousand occupied by the Louvre, the biggest museum in the world. But it was no use having a large extension of lands if the family did not have any money to hide under their mattresses. In the early 1960s, they had packed their bags to leave the city and return to Rio Grande do Sul. They delayed their departure for a last attempt; in 1963, Don Antonio bought a small restaurant in front of the grape yard and left it under the care of his daughter, Flora, and his son-in-law, Admar Bertolli. A new chapter in the history of the Madalossos began. The success was instantaneous. In three months, all 24 seats of the restaurant were not enough for the queue which was formed every weekend, looking for their creamy polenta, their chicken stew and their radicchio salad with vinegar and a touch of wine which Flora prepared as she had learned from her mother. In the front of the house, Carlos, Nelson, and João worked as waiters. The family increased the space as they could, and, in 1970, they tore down the grapevines to build Novo Madalosso, then with 400 seats. It was during this expansion that two of their menu items received a more ‘Brazilian’ treatment, and became the most iconic snacks of the restaurant: the creamy polenta began to be served fried, in cubes, in the chicken which was previously stewed began to be served fried in small, bite-size pieces. They don’t regret it. It was precisely those stainless steel trays, loaded with chicken wings, polenta, and homemade pasta, which made Madalosso a reference throughout Brazil and the world. “I’ve catered to five presidents, Pelé, famous people from abroad, and now I’m serving these dishes to people who even have great-great-grandkids,” says Flora. Even though she didn’t want it, Flora passed on her unconditional dedication for her work to the next generations. Her three children worked on the business since an early age, as well as the sons of her five brothers. As a consequence, they all formed partnerships, which resulted in several other establishments. “They all began to work a very early age, 15, 16 years old, to help out their families. We were raised in this restaurant culture. We talk about it at breakfast, lunch, and dinner, and by the time we realize all this has been incorporated into us. We end up doing it by practice. There’s almost no way out,” jokes 40-year-old Beto Madalosso, Flora’s nephew, responsible for two branches of Forneria Copacabana. It was precisely like that with 31-year-old Agatha Madalosso, Flora’s granddaughter. Even though she dreamt of studying Medicine, she decided to embrace the family business 18 years ago, to help running Velho Madalosso and the pay-by-weight buffet Anello, next to her father (Marlos, Flora’s son), her brother (Marlus) and her uncle (Marcius, Flora’s son). “It is the continuation of the family, there’s no way of stopping it,” she says. The way she found is to divide her time: Agatha recently concluded her fire brigade course, and is about to begin nursing school, so she can work, during her spare time, as an ambulance rescuer. As the sky grows dark, the lights of all six buildings around Novo Madalosso light up. Siblings, nephews, and grandsons finish their coffee, and walk towards their respective houses. Flora leaves the table, and begins to wear her working apparel again. It is Sunday night, but work never stops. She still needs to go to her first restaurant, to meet old customers and check if everything is in order. On the following day, as soon as the sun rises, she will be ready to begin her week, and, next Sunday, the table at her home will be set to welcome the family once again.